How to choose a mountain bike fork: Front suspension is what differentiates mountain bikes from the rest of the two-wheeled world. Because of it we can navigate rock-strewn trails with confidence. Modern forks are available in several sizes and shapes, and each one is designed for a specific riding style. Choosing a fork may be intimidating at first, but the feel of a bike with new suspension is a great reward. Mountain bike forks can be classified into four major categories: downhill, freeride, all-mountain and cross-country. The type of damping system they use also differentiates forks; both air and coil sprung options are available. Air forks are lighter, and generally more expensive, but coil sprung forks perform just as well with only a minor weight penalty. Both offer a different feel and are available for all riding styles. Downhill - These are dual crown forks with 8 inches of travel designed specifically for shuttle and lift access riding. They offer rebound and compression adjustments so riders can tune their forks according to the terrain. They are most commonly found with 20mm through-axles, integrated stems, and 1 1/8-inch steerer tubes. Freeride - Forks designed for the rigors of big mountain riding have oversized stanchions, up to 8 inches of travel, are usually single crown, generally use 20mm axles, and have similar adjustments to downhill forks in a more agile package. Long travel models may use 1 1/2-inch or "tapered" steerer tubes, which require a frame designed to accept them. 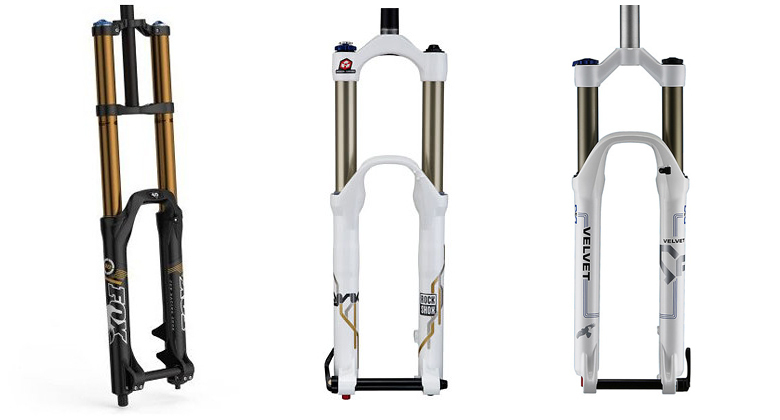 There are also light duty freeride forks built for dirt jumping and street. At just 100-125mm of travel, they are much smaller and lighter but are still built for abusive riding. All-Mountain - This range includes forks made to withstand aggressive trail riding, while maintaining the ability to climb efficiently. They typically range from 4 to 6 inches of travel, and many models can adjust the stroke length without a tool. Remote lockouts are popular on this type of fork. They also have a great deal of external adjustments and technology to improve pedaling efficiency. 15 and 20mm through axles are the most common. Cross-Country - These forks have the least amount of travel and are also the lightest range of forks available. Keeping weight low while allowing for maximum pedaling efficiency is the goal of high-end XC forks, while less expensive models emphasize value and smooth function. They are often equipped with a lockout, rebound and compression adjustments. Cross-country forks use 15mm and 9mm "quick release" axles. Fork sizing depends on the steerer tube, the axle, and the size of the wheel. Steerer Tube Diameter - The standard steerer tube size is 1 1/8-inches diameter. Oversized 1 1/2-inches and "tapered" steeer tubes that are 1 1/8-inches at the top and 1 1/2-inches at the crown are also common. Axle Diameter - Standard quick release size is 9mm diameter.15mm through axles are found on all-mountain and cross-country forks. 20mm axles are the standard for freeride, downhill and many all-mountain forks. Wheel Size - Mountain bike wheels and forks are available in 26-inch, 27.5-inch (also known as 650b), and 29-inch options. Forks are made from a combination of materials. Lowers can be made from magnesium or aluminum. Stanchions, crowns and steerer tubes are either a>luminum or chromoly. Coil sprung forks use either steel or titanium springs. There are a lot of different aspects to consider when purchasing a new fork. Luckily, finding the perfect fork can be a relatively simple process if you take the right things into consideration. The first thing to do is ensure that the new fork is compatible with your bike on three levels: the hub diameter, headtube size and wheel diameter. If all three of these are satisfied, the fork should mount to your bike without a problem. Next, start looking into the style of fork that best suits your riding style and ability. Finally, find out how much you need to spend to get what you want out of a new fork. Forks range in price from $150 to $2500. Forks in the $150-$600 range are generally entry level or intermediate forks designed for light trail, cross-country or basic freeride and dirt jump use and have limited adjustability. Moving to the $600-$1200 range, forks begin to incorporate all of the available options: external adjustment of rebound, compression, travel and lockouts. This range includes some downhill forks, as well as many all-mountain, XC and freeride models in every available size. The $1200-$2500 range includes top of the line downhill and XC forks that provide competition level performance and weight. It also includes all-mountain and freeride forks with numerous adjustments and high-level features.